Students who are law aspirants must be looking forward to the details of the admission process of the DULLB Exam 2019 including the part where DU LLB 2019 answer keys are released. A brief introduction to this law entrance exam is that it is the exam which acts as the gateway to three law colleges affiliated to the Delhi University. All these colleges offer 3 year LLB programs. Let us move forward and discuss the answer key announcement in detail. The DU LLB exam will be held in June 2019 and the DU LLB answer keys will be released soon after. It is being said that DU LLB 2019 answer keys will be available as soon as two days post the exam or maybe even sooner i.e. within 24 hours of the law entrance exam. Once the DU LLB answer key is in the public domain then students will know what scores they can expect and whether they stand a chance of clearing the law entrance exam on the basis of last years' cutoffs. Although one may not have to use the last years' cut off as many coaching institutes will release approximate cutoffs for 2019 and one would be better off using these instead. Do remember that you have to add 4 marks to your score for every correct answer and reduce 1 mark for every incorrect answer and questions not answered make no difference to the score. Also when you marked two answers then that is considered a wrong answer and you again have to deduct 1 mark from your score as the penalty. 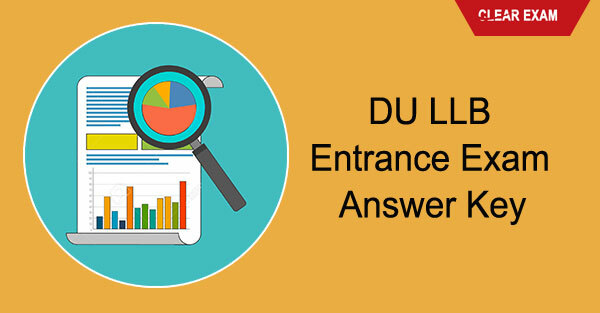 You can find the answer key on the online DU portal for the DU LLB exam which is www.du.ac.in. Once on this page, you should look for a tab named," DU answer key" or "DU answer sheet". Click on that tab and provide your roll number or registration number. Your relevant answer key will open on the webpage. Save this page or download the page and take a print out if required. The DU LLB answer key page will be in PDF format so make sure you have the PDF software on your machine where you are checking the answer key. Match your answers as per the DU LLB 2019 answer key and if you think an answer mentioned in the DU LLB answer key is incorrect and you are sure then immediately contact the Dean, faculty of law, the University of Delhi along with documents which support your statement as proof. You have to make this representation about a wrong answer stated in the DU LLB answer key within 48 hours of DU LLB 2019 answer key becoming available in the public domain. Once all representations regarding the DU LLB exam 2019 answer key are received by the nodal officer then a committee will sit and discuss the matter and if an error or errors are found then the final DU LLB 2019 answer key will be released which will be free or errors. DU LLB Entrance Exam Results for entrance into the three-year course will be announced on June 2019. That is all that you need to know about the law entrance exam admission step of release of Answer Key.